For some reason this post about my cooking school experience has been one of the more difficult posts to write. Not because my experience was bad ( the exact opposite) because I loved it. But rather because once I wrote it, I think I felt like that experience would be over, for good. You know, like as long as you don't accept something, it is not real. Right? Well now that it is 2014, I thought it was about time I accepted that cooking school is over and share my experiences here. 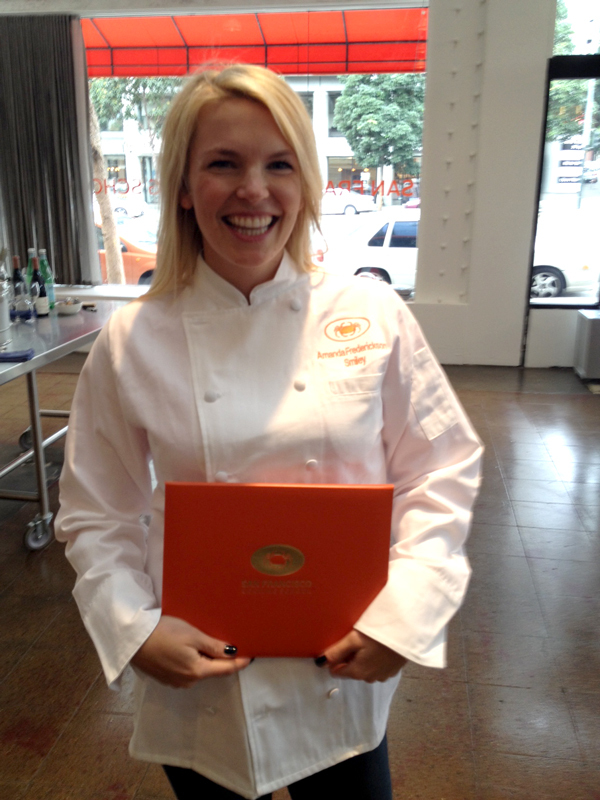 For those that may/may now know, back in May of last year I quit my "cushy" job and went to cooking school full time at San Francisco Cooking School. It was a huge shift but something that I always had wanted to do. One day I woke up and basically thought to myself that life is too short to be doing something you don't love, especially when that thing that you don't love involves 2 1/2 hours of commuting each day. Ugh. I had met Jodi, the owner of San Francisco Cooking School, when I first moved to SF 7 years ago, when I attended a cooking class she was teaching at another school in the city. Cooking school always sounded amazing but I could never really get comfortable with the idea of quitting my job and doing that. But one day she emailed out of the blue to share the news that she was opening her own school here in SF. I was pretty unhappy with my job and was spending every hour during my weekends cooking, so I thought it was a sign from the kitchen gods. Long story short, with Luke's (incredible) support and Jodi's amazing school she created, I built up the courage to quit my job and go to cooking school. And I had the time of my life. School started in May and was full-time Monday through Friday from 9am - 3pm. I would spend 4 months in a kitchen classroom and 2 months at an externship in a real live working kitchen. The kitchen classroom was amazing. The first thing that you learn is that standing on your feet all day is exhausting if that is not what your are used. And man I was not, sitting at an office desk for 10 years doesn't really prepare you for that. Each week we would cover different areas of cooking like vegetables, grains, pasta, pastry and butchery. One day we had a half of a pig to butcher. Never in a million years would I have thought that I could (or wanted to) butcher a pig. But we all dove right in and broke down this amazing creature. Don't tell anyone but I loved it. I felt bad for the pig, yes, but it was fascinating to see how the animal came together and what parts were where and how we could cook with them. We also had amazing guest lectures/guest instructors come in and share their recipes and their ideas. We also took incredible field trips to local food vendors and business including a working farm in Sonoma, a SF sustainable fish monger, as well as foraging with Hank Shaw. Another part of the program was the ability to be a teacher's assistant for the recreational classes held at the school at night. Jodi might be one of the most well-connected chefs in the city and manages to have amazing teachers come in and teach these classes. Check out the current line up here, but during my stint as a teacher's assistant I helped amazing classes like Pasta 101, Recipe Testing and Development, and cook the cookbook classes on the cookbooks from A16 and Zuni Cafe. I also met some amazing chefs in the process. The 4 months in a classroom culminated with restaurant week where we turned the school into a full on restaurant for our friends and family. We made the most amazing meal that I would have never thought I could make before going through school, including homemde pasta and homemade sausage! Check out the menu. I still dream about that boudin blanc. After the classroom I went to work at my externship, a local Michelin stared restaurant. Nothing could have prepared me for that. It might have been the most intense thing I have ever done. I am not going to lie and say that I loved every minute of it, because I did not, but I do believe I am a better chef for it and proved to myself that I could really do anything that I wanted to. Most times I was the only girl in the kitchen running in and out of what is affectionally known as the "hobbit hole," a tiny room in the restaurant that housed all the dry goods. There were days that I would say to myself - you just have to put your head down and get through this. By the end of the two months, I had found my footing as a restaurant cook but it proved to me that I am not destined to work in a restaurant. That is not why I love food. But I do have a huge appreciation and respect for anyone that ventures that route. So now what? The program is over, officially since I wrote this post, and I am figuring out the next steps in my food career. I will keep you posted as I figure it out, but I promise it is going to be tasty, regardless. One last thought before I sign off - if you have ever wanted to go to cooking school, my advice is just do it. The whole time I was there my thought was this is amazing, but I sure wish I had done it sooner.